€5 billion has been raised in Germany through the auction of frequencies to mobile network operators. The action included the 700MHz band, which is currently in use by digital terrestrial television in Germany and the rest of Europe. All three German mobile network operators won a slice of spectrum. Vodafone and Deutsche Telekom received the biggest chunk of the frequencies on offer, which also included blocks of spectrum at 900 MHz, 1500 MHz and 1800 MHz. Telefonica (O2) received the smallest chunk, but all three companies obtained 2x10 MHz allocations in the 700 MHz band, which translates to UHF channels 49 to 60 in the current TV frequency band. Germany has thus become the first European country to auction off the 700 MHz frequency band ahead of this year's World Radiocommunications Conference (WRC 15), which will determine which frequencies will be left for terrestrial TV broadcasting across Europe. Authorities in Germany are eager to bring faster broadband to rural communities. Although the 700 MHz frequency doesn't have the same data capacity as higher frequencies, this frequency band, along with the 800 MHz frequency band, auctioned off in 2010, is good for serving large areas from one single mast. Cynics point out that some of the TV frequencies that have been auctioned off will probably be used to stream TV to viewer's mobiles, but this time subject to user's mobile data allowance. But in Germany, far fewer households than other European countries rely on terrestrial TV, thanks to a high uptake of cable and satellite services. 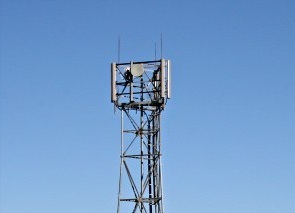 With news reports from the country emphasising how rural coverage will be improved with up to 50 Mbps download speeds because of the outcome of the 700 MHz auction, broadcasters who are losing frequencies may well be asking what are mobile networks are doing with the 800 MHz frequencies they obtained from TV, which is also supposed to be ideal for covering rural areas. And while broadcasters are switching to DVB-T2 in Germany in order to save spectrum and facilitate HD TV starting next year, forcing new hardware and aerial changes on viewers, mobile network operators are holding on to older technology based on 2G and 3G networks as well as current 4G/LTE technologies over an ever increasing range of frequencies, despite consumers readily changing phones more often than their TVs and aerials.